Heat oven to 450°F. Spray 18x13-inch rimmed sheet pan with cooking spray. In small bowl, mix 4 tablespoons of the honey, the lemon juice, garlic and pepper flakes. In medium bowl, mix squash, oil, 3/4 teaspoon of the salt and 3 tablespoons of the honey mixture. Toss to coat. Add squash mixture to pan. Season chicken with remaining 3/4 teaspoon salt and the pepper. 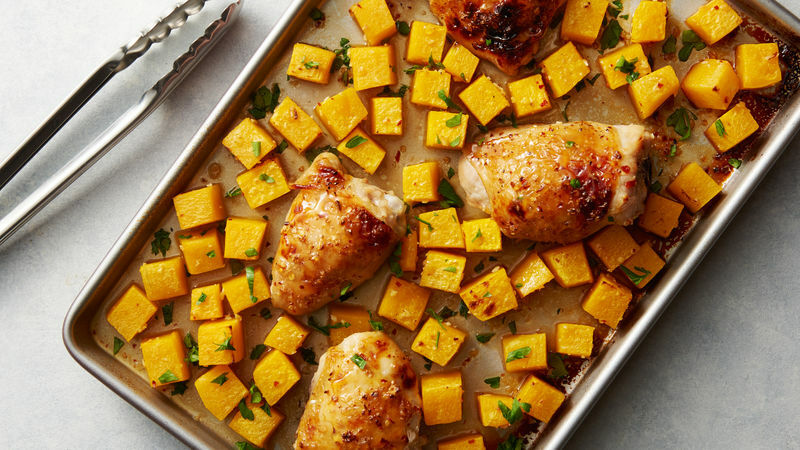 Add chicken to pan of squash; brush with 1 tablespoon of the honey mixture. Roast 15 minutes. Brush chicken with remaining 1 tablespoon honey mixture; return to oven 10 to 15 minutes or until juice of chicken is clear when thickest part is cut to bone (at least 165°F) and squash is lightly starting to turn brown and is just tender. Remove from oven; drizzle remaining 1 tablespoon honey over chicken, and serve. Chopped parsley makes a lovely garnish for this dish. To save time, look for precut butternut squash in most grocery store produce sections.